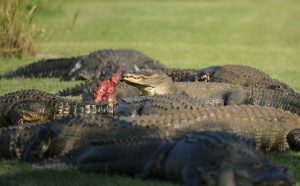 Are you fascinated at the thought of over 450 alligators in your presence? 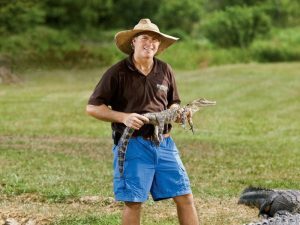 We were, which is why we started alligator farming in Summerdale nearly 14 years ago. We wanted our farm to be enjoyable for everyone in the family. 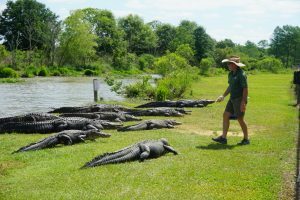 From alligators seen in their natural habitat to other inhabitants including turtles, ospreys, owls and bullfrogs, adventure awaits you at every turn on a self-guided tour through the swamp! If you haven’t visited our farm friends yet, it’s time to start planning. Our park is now open for spring and summer seven days a week! So once you get here, where do you begin your adventure? The first exhibit you’ll find after leaving our gift shop is through the covered walkway where we keep the itty-bitty fellas. 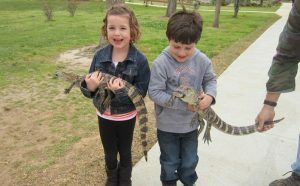 If you grabbed some of our “alligator chow,” this is a good place for you and the kiddos to start passing out the snacks. As you make your way through, a few hogs will catch your attention just over the fence. We have three new additions to keep our guy Moonpie company. 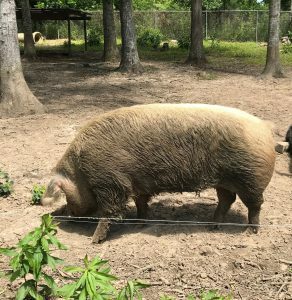 Moonpie is around four years old and weighs a trim 500 pounds. Be sure to wave so they don’t feel left out! Ready for something more intimidating? Keep moving past the “teenagers” in their private pools, and make your way over to the boardwalk that leads to the big guys. 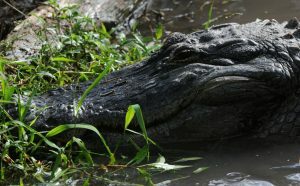 While peering through the swamp and searching for Captain Crunch, you’ll notice some alligators stay hidden in the moss, while others are out and about ready for show time, or, as we like to call it, our live feedings. 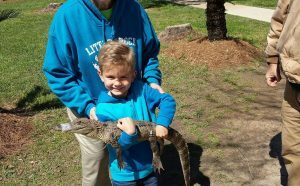 Everyday at 11:00 a.m., 1:00 p.m. and 4:00 p.m. we have our live feedings – a must-see event featuring dozens of our hungry alligators climbing ashore for a good meal from our staff! 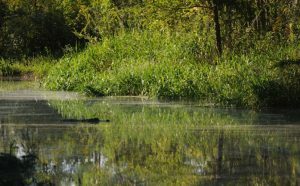 As soon as they hear the dinner bell ring, they make their way out of the water and onto the grass to catch a bite. You don’t want to miss this show! 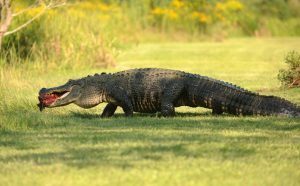 While we have a variety of animals like longhorns and ospreys, we definitely count on the alligators to be the leading excitement factor for visitors. If you’re planning a trip along the Gulf Coast this spring or summer, be sure to make a stop in Summerdale to catch one of our live feedings! For farm updates, live videos and funny photos of our best guys, like us on Facebook and follow our Instagram page!